Ann Marie, this is SO cute!!!! Now I have to get this set! Thanks for a fun sketch this week! I was wondering how I could use this stamp. It's so cute. You did it perfect. Absolutely adorable, Anne Marie! It's perfect in pink! And who can resist those pearl eyes! Isn't he just the cutest piggly-wiggly! 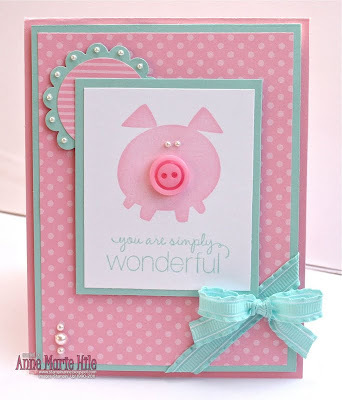 Love your selection of the curly sentiment and curly ribbon to go with the piggy. These colors together are fabulous and his little pearl eyes are the best! You've made me look at this set in a whole new light! Great sketch this week too! Cute card. Love the colors you chose. This is so stinkin' cute! This set will be ordered on my next order. The colors you used are beautiful together! 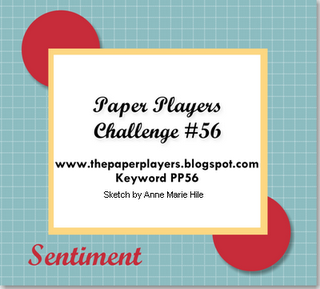 Looking forward to playing with your sketch this week! Thanks for the adorable inspiration! Adorable!!! Love that image and button. Toooooo CUTE! Oh, and the sketch is fabulous! omgoodness......that button nose is TOOOOO cute!!!!!!!!!!!! I think I'm going to play in this challenge this week!!!!! Gotta color up some images!! This is adorable! 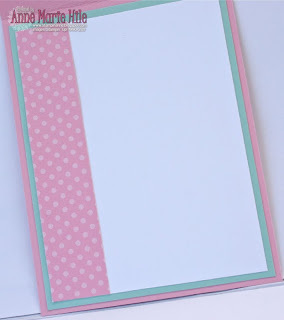 Your sketch is so cute and I love how you used a bow as a corner element! Love it! What an adorable CAS card. Just love that little piggy. Such pretty colors too. Your saying is just perfect to reflect his cute little piggy tail. Thanks for sharing! OMGoodness, this is soooo cute! That sentiment is perfect and the colors are candy-sweet! I just got button buddies. I can't wait to use it. Beautiful colors and the little pig with his eyes and pinkie nose- too cute !! 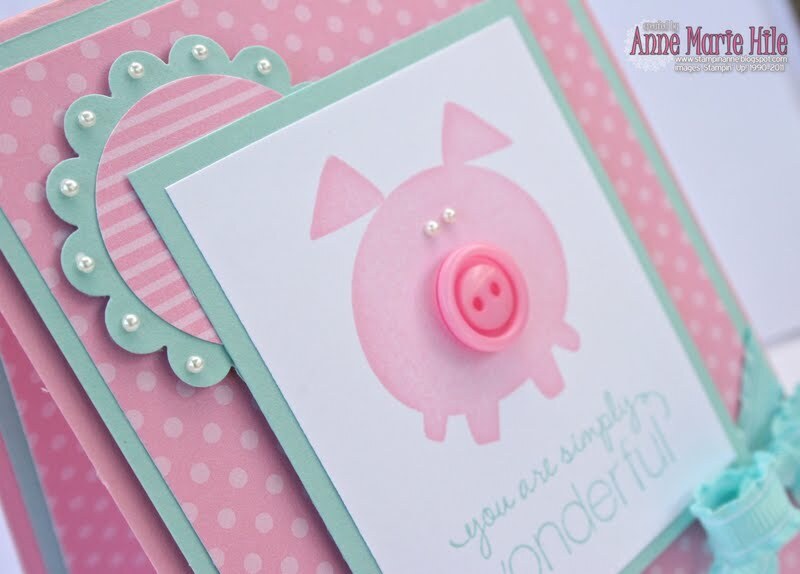 I love this delightful pink pig with the button nose and pearl eyes!! What fun, Anne Marie! I love this little guy! I just ordered this set and can't wait for it to come. I just found your blog and will do some looking around while here. We are both Texans! I've seen a lot about Craft Project Central and would love to win a subscription to check it out. Thanks for the offer. This is so cute, love the piggy with the button and what a great sketch!! 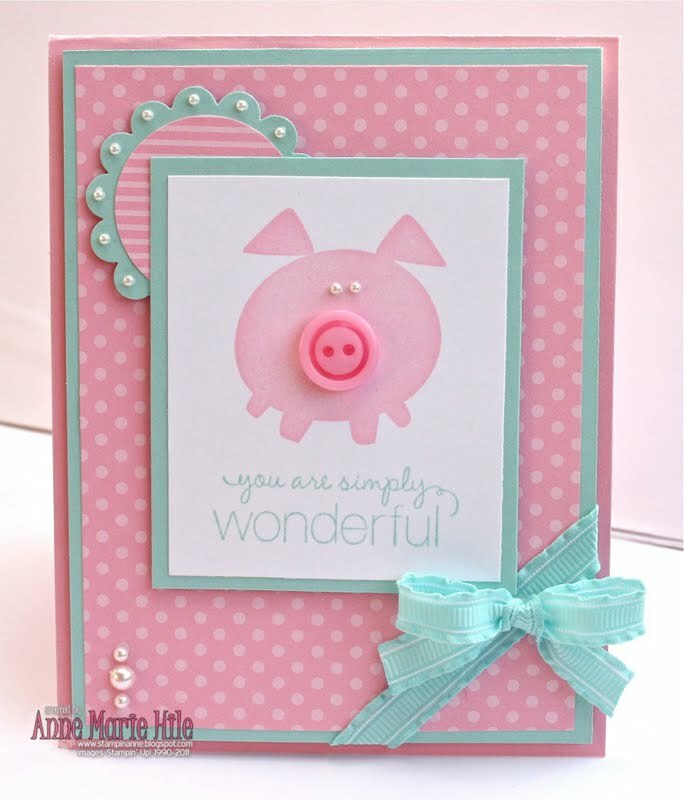 Adorable "piggy" card. I love the colors you used. PS: A little late on the comments (been on vaca most of July! yeah baby)... but just hard to get back into swing of things. Hugs. This is too cute! This set is on my next to order list already, but now I really want it! I completely understand the need to add more to cards (I have to make myself stop! ), but I couldn't imagine an AM card without a little pearl or bling somewhere... Beautiful job! I love your cute little button-nosed pig, AM! The Pretty in Pink looks fantastic with the Pool Party. How adorable and the colors work so well together. This is such a cute little set. 'Wat een schatje!!!' We would say in Holland! This is so darn cute dear Anne Marie. That pink is just the best. Love the layout! TOOOO CUTE! I love this cute little piggy with his button nose. Great job with the sketch. It is a fun, versatile one. Oh.....my....gosh!!!! Is this adorable or what!?!? Anne Marie, I have had limited net access since late May and I see I have missed out on SO MUCH! I am out visiting my parents for a week and soaking up some computer time. I can't wait for mid-August to get here so I can catch up on all the adorable stuff my favorite blogs have created. Keep up the awesome work!